The most recognisable face these days in Israel is that of a missing person. His name is Gilad Shalit, a 23-year-old corporal held captive for more than three years in Gaza by the Palestinian movement Hamas. The sensational press constantly report every shred of information about him – leaked more than often by not-so-reliable sources, thus creating an emotional rollercoaster for an entire nation. But the dilemma facing Israel’s prime minister, Benjamin Netanyahu, is far from simple. Shalit was kidnapped by Palestinian militants who crossed the border into Israel in 2006, a year after Israel’s disengagement from Gaza. A video released by Hamas just 10 days ago was the first visual sign of his good health. As a matter of tradition, negotiations between Israel and its neighbours are never on an equal basis. In June 2008, for example, Israel swapped five Lebanese convicted terrorists for the bodies of two of its dead soldiers. Now Hamas wants Israel to release 1,000 Palestinian prisoners for Shalit. One thousand for one, that’s the equation. Hamas and Abbas’s Fatah party are at loggerheads over governing the Palestinian people. Releasing so many prisoners, says Rubinstein, would be perceived as a tremendous success for Hamas, thus ridiculing Abbas in the eyes of his people. Israel might not be a huge fan of Abbas, but much less so of his militant opponents in Gaza. The end is yet to be seen. In the meantime, Netanyahu is trying to barter for the best bargain he can. But as in so many other cases in the region, Israel remains without any really good cards in its hand. “There are prettier ones”, wrote once the Israeli poet Nathan Alterman about the city of Tel Aviv, “but none share its beauty”. Just like a child that is loved and cherished by his parents simply because he is their own creation, even if another boy might be taller or somewhat faster, so was Tel Aviv held dear by the poet who emigrated from Poland in 1925, simply because it was his own city, where he was neither a stranger nor a second rate citizen. As its citizens now celebrate the 100th birthday, Tel Aviv still fulfils this same purpose of allowing the Jews a place of their own, a city where they can once and for all govern themselves and in which they can take pride. Indeed, Tel Aviv’s leafy boulevards and trendy bars are a reminder of how successful the Zionist movement is, and how well it achieved its main goal, which is a descent and honourable life for the Jews. Consider this: after 2,000 years that Jews have not built a city, 66 families assembled on bare dunes just north of the mostly Arab port city of Jaffa. That was 1909, just 100 years ago, and the wandering Jew decided to build upon the wandering sands a permanent dwelling. 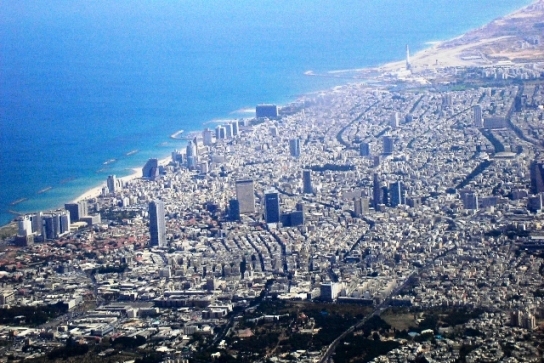 By 1920 Tel Aviv had 2,000 inhabitants, by 1924 almost 20,000, and by 1925 – 40,000. Nowadays it’s a bustling hub with a population of more than a million in its metropolitan area. As an act of defiance to 2,000 years of tradition, Tel Aviv’s founding fathers placed at the heart of their new community a secular educational institution instead of a synagogue. At the Herzliya Gymnasium, named after Theodor Herzl, students would learn for the first time in Hebrew, not in Yiddish or in any other European language. This Promethean deed was only the first in a series that would position Tel Aviv at the heart of the modern and secular Zionist revolution. “The first Hebrew city”, as it is called, came to symbolize Zionism’s break with the past, and its rejection of any kind of ghetto-like circumscription. Indeed it was a choice – a choice to break with the Eastern European shtetl in favour of liberal and modern ideas. Jerusalem is of course Israel’s capital. It is also the historic, religious and emotional centre of the Jewish world. But had it not been for Tel Aviv, Israel wouldn’t have been such a modern, liberal and western country. If Jerusalem stands for the past, with its solid rocks and tense emotions, Tel Aviv stands for the future, with its Mediterranean climate and optimistic easygoingness. Sir Patrick Geddes, the Scottish urban planner responsible for Tel Aviv’s master plan, said back in the 1920′s that it is a Jewish city that really lives, free of inhibitions felt so often in Jerusalem. It is in Tel Aviv that finance and commerce take place. It is Tel Aviv that artists, musicians and actors flock to. It is in Tel Aviv where the four largest newspapers are located, and two of the largest universities, not to mention innumerous schools, galleries and art venues – all of which operate in Hebrew. Not that it’s always an easy city. Patience, for example, is a commodity on demand: a shrewd observer once suggested defining the shortest unit of time as the splits of seconds it takes a driver in Tel Aviv to blow his horn when a red traffic light turns to green. And everyone has something to say – that’s why the main square of Tel Aviv turned quickly into a debating platform, where week after week rightists, leftists, pacifists, atheists and you name it, come to demonstrate, voice their opinions and share their aspirations. It is by far the most plural and open city in Israel, not to mention the whole Middle East. In the late 19th century, when author Elhanan Levinsky wrote in his utopian novel that in the first Hebrew city “no one will ask you who you are, what your business is, and from where and to where you are going”, he couldn’t have envisaged that one day gay and lesbian Palestinians will find refuge in Tel Aviv. But they do, because they feel safer there than in their traditional and repressive environment. Drive in its streets at 2am in the morning on a given Thursday night, and you’ll find yourself in traffic jams more often seen in London or New York during rush hours. You’ll see old people and young, dark-skinned and blonde, elegantly dressed and trashy. Just a few days ago, while walking a Tel Aviv street at night-time, I have seen a typical view of this mixed and vibrant city: young people crowded the pavements, drinking cava. Above their heads were suspended posters of American President Barack Obama. Large garbage cans were leaning against the display window of a “Caucasian Coffeehouse” (whatever that means). This chaos reverberates the words of the first city engineer, Yehuda Megidovitz, who used to say: “First you build, then you do the measurements”. But it is exactly this pandemonium that gives Tel Aviv its irresistible charm – the feeling that whoever you are, you’ll find your place there. The whole point of the Zionist movement was to find a place for the Jewish people and to bring it back to life through a concrete geographical space. No other place does this better than the city of Tel Aviv, which might be called the capital of Zionism. Its 100th birthday should be seen as the clearest proof for Zionism’s triumph.